I needed to get the staging area track laid first. I also realised that I needed to get the bus wires in. The next step was to wire up the section controls and the DCC controllers so we could test the first trains and wiring. I purchased 100M of household power wiring and stripped the insulation so the three insulated wires were exposed. One red, one black and one green wire. The red and black would be the major bus wires separately labeled to identify their circuit. The wires are 2.5mm copper and rated at 15amp. For the staging area which also was a reversing loop my bus wires would be a green and white wire. All the switches would have the frog isolated by cutting through the rails just before the frog, and soldering jumper wires across the outer rails to provide continuous power. Previously I have cut the rail with a Dremel saw but on too many occasions I slipped and hit the out rails. So this time I ordered a jeweller's saw from Micro Mart to do small fine cuts. The cuts were sealed with .010mm plastic super glued into position. The frogs are all powered with "Frog Juicers" from Tam Valley, in California. Below is the frog isolated section with plastic super glued into the gap. 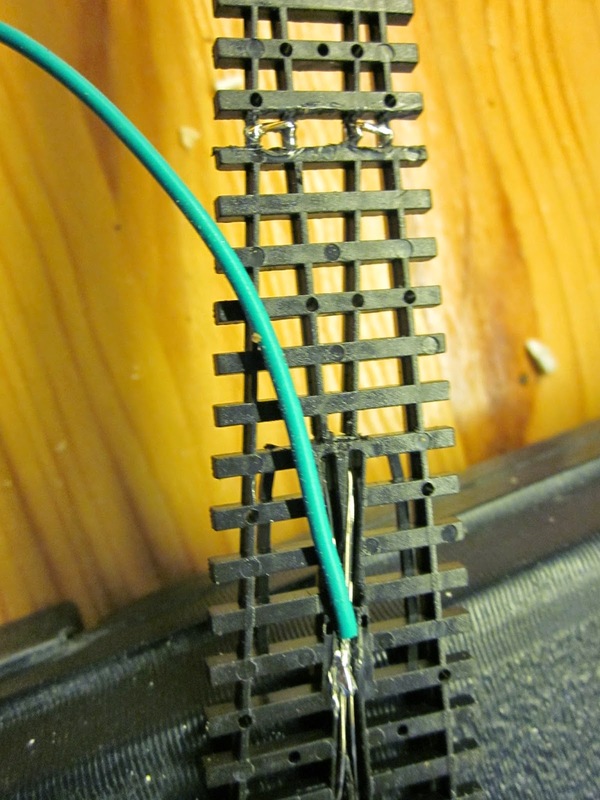 The second photo is a green wire soldered to the frog of the switch. This lead goes to the Tam Valley "Frog Juicer" which switches the polarity and provides continuous power to the isolated frog of the switch. All the switches will initially be controlled manually. 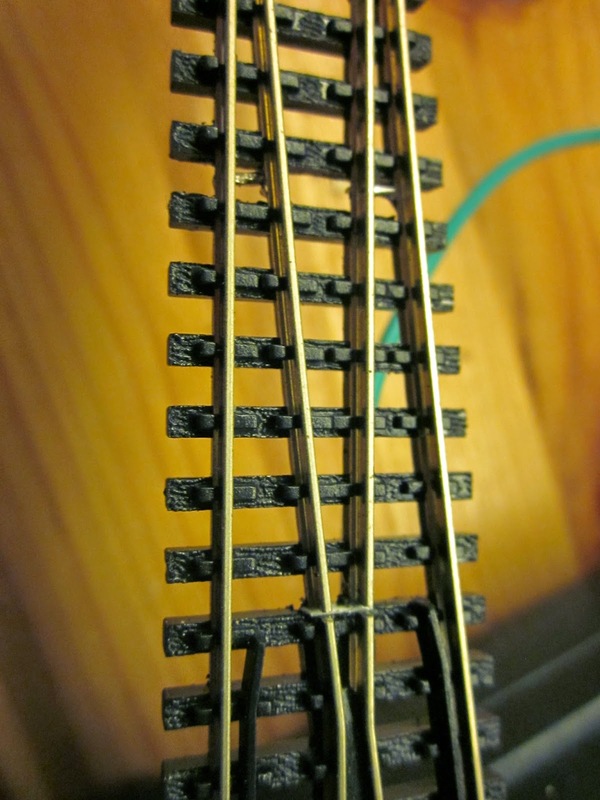 The Peco switches have throw bars with "blobs" on each end which is ideal to push with the fingers, or as one member of the local NMRA does move with the top of a clutch pencil. The clutch pencils have an indentation in the end exactly the right size to fit over the Peco "blobs". I will probably get around to making some combined uncoupling picks and switch activators from plastic or wood in the future. All track is wired prior to installing. I cut the dividers between the sleepers underneath and file and tin the rail prior to adding the jumpers. A couple of tools are handy to strip the insulation from the cable and to bare the bus wires to connect. 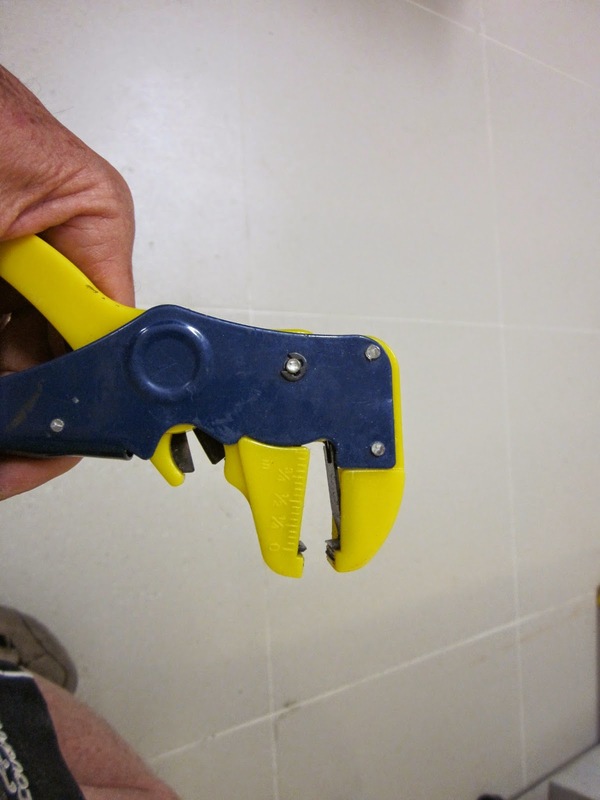 Here are some pictures of the tools and stripping wire. The layout will be divided into 4 separate electrical circuits protected by circuit protectors. Here are the 4 circuit boards - one has three circuits and the other is a single. The staging tracks are connected to the single control. All good - connected up to the Command controller and voila - the train ran on the staging tracks. Here is the first train on tracks.